ANGLO American would consider a proposal to use its 70% stake in Kumba Iron Ore as a founding asset to create “a different type of entity”, said the UK listed firm’s CEO, Mark Cutifani. Commenting in an interview in May for Miningmx’s Mining Yearbook regarding the group’s plans for Kumba, Cutifani said: “We haven’t made a final decision, but we can be flexible depending on how the [South African] government, major shareholders may want us to think about things. “So if a case is put to us, that maybe you could put two or three assets together and help create a different type of entity in South Africa, we’d be very open to that conversation”. Cutifani said in February that Anglo planned to unbundle or sell its shares in Kumba as part of a strategy to cut costs and restore the health of the balance sheet by cutting net debt. It would focus on platinum, diamonds and copper production. Asked whether formal discussions had taken place with the South African government regarding these plans, Cutifani said neither formal nor informal discussions had taken place. “We’ve had people who have got interests suggesting those possibilities who have probably spoken to government and other players,” said Cutifani. “It’s something that we would consider if it made strategic sense, and if it was right for our shareholders and we felt that it provided something that the government could support, then we’re very open,” he said. It’s thought the Public Investment Corporation (PIC) is interested in taking forward a proposal first mooted by former South African mines minister, Ngoako Ramatlhodi, that a ‘South African mining champion’ be created consisting of assets that mining multinationals no longer wanted. Said Cutifani: “Again that was also part of the reason why we laid out the full plan is to give all of the key stakeholders in South Africa the chance to think of what might work in the South African context. We’re very open and we’ll always engage in those types of conversations”. 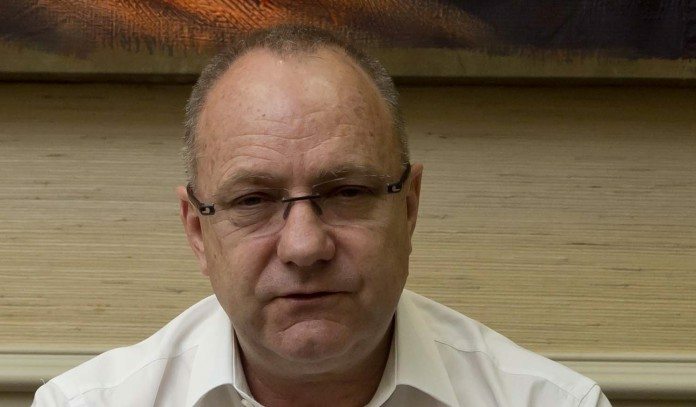 Commenting on new proposals in the updated mining charter, which the government gazetted in Parliament in April much to the surprise of the mining industry, Cutifani said it would “freeze investments” in its current form, and make the South African mining sector “uninvestible”. Said Cutifani on the mining charter: “The only problem I have with that is that it creates more public uncertainty and you have people speculating and it freezes investment. In the interview, Cutifani also said that he intended to stay CEO of the group for between five to seven years in terms of a commitment he gave to the board on his appointment in 2012. IT’S fair to say Mark Cutifani, Anglo American CEO, has been through the wringer this past year. December was among the toughest of months. Addressing analysts in a trading update he tacitly acknowledged a 2014 strategy to streamline the group, improve cash flow, and lower debt had been outpaced by the rate of economic decline in China during 2015; he simply hadn’t moved quickly or far enough. But he also stood by a refusal to issue shares to support the balance sheet, even with the threat of a sub-investment credit rating hanging over the firm’s head. Analysts were vitriolic. It had been a mistake to hold Anglo shares at all, said one. The key mistake the company and analysts had committed, countered Cutifani, was failing to forecast how hard the landing in China would be. As far as the world of corporate mining goes, this was suits in fisticuffs. Cutifani ended the briefing saying full detail of a more aggressive restructuring would follow in February. It left everyone dissatisfied whilst Cutifani struck a slightly shell-shocked, crestfallen figure. Asked about those shrivening months, Cutifani is philosophical. “It almost felt like … our restructuring was being delivered, but commodity prices were falling away faster than even we could restructure. So what we said in December is we’re going to take three steps out and get ahead of the curve”. What followed was a plan to cut the number of Anglo’s mines to between 20 and 25 key assets from 55 – a process which also enabled the halving of the divisional structure from bulk commodities and industrial minerals to just three focusing on diamonds, platinum and copper. The payroll would be cut to less than 50,000 from 135,000. The planned reduction in net debt would be between $3bn to $4bn to about $10bn this year, and a total de-leveraging of up to about $6bn over time. Analysts remained unconvinced. Kieran Daly, an analyst for UBS, downgraded Anglo in March saying the market was not conducive to Anglo’s aggressive selling down of assets which included its bulk producers such as Kumba Iron Ore and, at a later stage, Minas Rio, the large Brazilian iron ore producer. “Not only has the cyclical downturn in commodity prices driven an acceleration in the evolution of Anglo’s operating strategy, but it is also likely to prevent its rapid execution in our view, due to the likely valuation gap between buyers’ and sellers’ expectations,” said HSBC in a note at the time. Shares in Anglo, however, gained a quarter between February and April leading Daly to issue an update that month. “We downgraded Anglo to sell in March as we believed the risk/reward was not attractive with the outlook for Anglo’s key commodities challenging and the execution risk on the proposed restructuring high,” he said. What he and analysts, and nearly everyone else hadn’t counted on, however, was a serendipitous recovery in commodity prices and strong share price performances, including that of Anglo American. The markets were being driven by a combination of short covering, dollar related investments in commodities, a degree of inventory restocking with perhaps a sprinkling of fundamental improvement. On April 28, Anglo had announced the $1.5bn sale of its niobium and phosphate division to China Molybdenum Company having earlier refinanced $1.8bn in bonds. It had already sold its 50% stake in Tarmac, an aggregates business, for $1.6bn – a figure that outstripped expectations – as well as getting some minor Australian coal assets away. Commenting on the niobium/phosphates deal, BMO Capital Markets remarked: “The key takeaways are that the $1.5bn price received is probably better than market expectations, that it makes significant inroads into Anglo American’s debt reduction programme, and that it potentially puts the company in a stronger negotiating position with regards to the rest of its asset disposal programme”. Said Cutifani: “People are now starting to see the benefits of all the hard work. “We consulted with our shareholders and we got really strong support. January was still tough, but we came out in February, and we’ve got some sales away now. Niobium and phosphate was very positive; nickel and coal are going very well in terms of the processing [of bids], particularly the interest on coal has been very strong. “Nickel has gone well as we’ve got competitive attention – not as aggressively as coal, but still enough interest for us to consider very carefully. So we are well on track to delivering our $3bn minimum [cut in net debt]”. It’s Friday so Cutifani is dressed casually in jeans and a plain white shirt. He looks more careworn than the last time we met, but he states he has no intentions of throwing in the towel. Now into his fourth year as CEO, Cutifani has given the board an undertaking to see the restructuring process through. “I always said to the board that I would give between five and seven years as a minimum. You don’t change an organisation in 18 months and, by the way, we were building the platform for the operating model,” he said. Asked what he thinks of Bernstein analyst, Paul Gait’s view on the restructuring – which was that Anglo was preparing itself for a sellout to private equity – Cutifani can afford to be a bit tongue-in-cheek. “I asked Paul if he’d just come back from his Disneyland trip,” said Cutifani. Gait’s analysis was fascinating and eye-catching, however. “No longer does this feel simply like an asset slim-down in order to repair the balance sheet in the near term,” said Gait in a report dated March 29. “Instead, it feels like a management team driving towards an exit of the business in the medium term,” he added. “I guess any of these guys get paid to carve out a different conversation,” said Cutifani. “I understand where they come from, but we believe the package that we’re building is very different in the market,” he added. The blueprint for this new operating platform was born out of a fundamental appraisal of Anglo’s position both to its history – Cutifani’s team examined went back 100 years of performance in order to understand its present position – and in relation to other diversified miners such as BHP Billiton, Rio Tinto and Glencore. In electing to focus on platinum and diamonds, as well as copper and, to a lesser extent, nickel, Anglo has chosen predominantly late cycle consumer markets – a decision which gives it a certain character. Platinum, diamonds and copper are also markets run on “more rational” lines. Bulk materials such as coal and iron ore are deposited geologically in a relatively flat horizon and are easy to access once the infrastructure is built and paid for. In the case of copper and nickel, the vertical deposition of the mineral is an obstacle to entry and makes these markets harder to dominate with volume. In addition to participating in markets where it has more influence, platinum and diamonds in particular are areas where Anglo can harness and adapt its century-long marketing skills which it believes is embedded in the DNA of De Beers. Whereas BHP Billiton and Rio Tinto sell minerals into a benchmark price, and Glencore trades, Cutifani believes that in diamonds and platinum, Anglo can market its products. “BHP sells bulk commodities and they get the benchmark. Rio is strong in understanding its value in use of its products and tries to get a little bit above that, and has generally done a bit better. Ivan [Glasenberg, CEO of Glencore] trades and uses an arbitrage of geography, time and quality and the volume of the market to do better,” said Cutifani. This approach on more focused marketing that was behind the decision of Anglo’s listed subsidiary, Anglo American Platinum (Amplats) to controversially end its marketing and research relationship with UK-based semi-fabricator, Johnson Matthey, and pick up the responsibility itself. It also ended the practice of discounting metal sales. “We’ve taken a different approach to marketing platinum having learned from De Beers. So we used to get 97% for our platinum of the listed [market] price. Today, its over 100%. In my view, you should be getting a premium for your product, particularly if you’re the largest producer,” he said. Wrapped up in the relationship is a reliability of supply. None of Amplats’ customers lost platinum supply during the five-and-a-half month strike waged by the Association of Mineworkers & Construction Union during 2012. “We are a reliable consistent producer and we’re carving out a position as the lowest cost producer,” said Cutifani. “We are responsible in the market; we’re not burying the market in platinum as they’ve done in iron ore. We’ve demonstrated that market discipline in De Beers,” he said. In the case of marketing platinum, Anglo is trying to drum up large industrial support for fuel cell technology for long range vehicles – not cars than run around the city – in order to create a new market. “We’re trying to convince some of the big manufacturers who are very interested in backing fuel cell technology, and we think that it’s a massive opportunity that we can develop with the government that has downstream beneficiation impacts,” he said. Cutifani was anxious to cast the second iteration of Anglo’s restructuring as a coup de gras or, as he terms it, avoiding “salami slicing” progress. Change by chapter is not on the agenda. Yet the changes he wants to instill may not be an entirely smooth process. A hiccough in commodity prices, which is possible, will interrupt progress; whilst failing to attract good bids will also hinder progress. The sale of Minas Rio cannot proceed now until the group has won all of its operating licences from the Brazilian government. And in South Africa, uncertain regulatory developments, such as the recent publication of a new mining charter, will make it harder for potential buyers to assess the opportunities. At the time of writing, the country’s Chamber of Mines and the Department of Mineral Resources (DMR) were locked in negotiations over the principle the government wants the industry to accept which is perpetual empowerment. Cutifani’s view is that his firm’s restructuring has to proceed against the current dispensation which recognises that if 26% empowerment in company shares is achieved, then an important criteria of the original charter has been met. Moreover, if the government has granted a new order mining licence to company it can’t simply take it back. The issue of ‘once-empowered, always-empowered’, as challenged in the new charter, will be an issue that must be “held in escrow” as it will be the last and most difficult point of negotiation between the industry and the DMR, he said. In other words, the show must go on. And Cutifani raised some interesting potential developments in the restructuring of Anglo’s assets. One is with Kumba Iron Ore that will either be unbundled to shareholders or sold in a standard trade sale; or perhaps not so standard. “Kumba is a third quartile producer, but it’s got good operations, high quality iron ore, and we’re doing well at the moment. We also think that Kumba could play a significant role in local beneficiation and local industry development,” he said. Asked to expand on this role, Cutifani commented: “What we’ve said is we are open to unbundling and/or sales of strategic stakes. We haven’t made a final decision and we can be flexible depending on how the government, major shareholders may want us to think about things. Selling the South African domestic coal mines, which was part of Cutifani’s original restructuring plan cooked up in 2014, remains an uncertain process owing to the fact that Eskom, the power utility in South Africa, has been vocal on its own rights to the mines. As a contributor to the capital of the cost plus mines, those mines that exclusively supply Eskom’s power stations, it has laid claim to ownership. Said Eskom’s executive for group generation, Matshela Koko: “Eskom technically owns part of, if not the majority of, operating assets and the mining infrastructure, while Anglo owns the mining rights and some of the surface rights”. Companies will “need to engage in order to effect radical transformation through the potential new owners,” said. Koko. He even suggested that Anglo ought to cede its mining rights to a state-owned mining company. “People know that in domestic coal, the preference is for local ownership to be more than 50%,” said Cutifani. “Now in the end that’s not at all a legislated requirement, but given that Eskom sits on the other side of the contracts, in the end, they are paying the money. So they do get to make a good part of the rules. In that case, it’s not probably something in the long term that will be material to us because the ownership component is so small,” Cutifani said. At the time of writing, some “60 conversations” over the ultimate destiny of the domestic mines – which produced about 22.5 million tonnes in Anglo’s 2015 financial year – had been reduced to a short list of six. Political risk is a fact of global business at present, said Cutifani. The emergence of the political right in the US and the UK, the impeachment proceedings in Brazil, and subpoena of the former president of Argentina, even the possibility of a sixth Australian prime minister in as many years, suggests that “… when economic times are tough, politics seems to be just as tough because everyone is positioning; people are unhappy”. But it’s clear the new mining charter and the glacially slow progress of amendments to the Minerals & Petroleum Resources Development Act in South Africa have the potential to permanently hurt the country’s profile as an investment destination.